US Ambassador Timothy J. Roemer will meet Tibetan spiritual leader Dalai Lama during a two-day visit to Dharamsala. Chimme Choekyappa, private secretary to the Dalai Lama confirmed the news and said that the US ambassador will reach Dharamsala on Wednesday and will meet Dalai Lama in his official palace on Thursday. Himachal Pradesh government has declared Roemer a state guest. 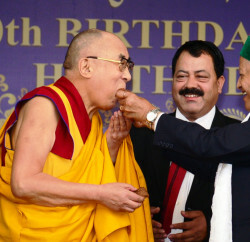 It is believed that Roemer will discuss issues relating to Tibetan exiles with the Dalai Lama. This would be the third highest official-level group to visit this town since March 2008 when US House Speaker Nancy Pelosi came to meet the spiritual guru. The visit also comes less than two years after a high-level group led by White House advisor Valerie Jarrett visited this town to apprise the Nobel laureate and his functionaries on the best way the US could assist in the resolution of the Tibetan issue.